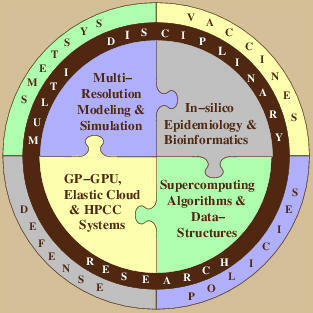 The Parallel and Cloud Computing (PC2) Laboratory is a multifaceted research body that consists of and is fostered by computational scientists pursuing a variety of scientific research involving parallel, distributed, and cloud computing. The researchers in the lab include faculty members at Miami University, graduate students, undergraduate students, and even high school students. The lab fosters a collaborative environment with access to state-of-the-art supercomputers and computational clusters to enable its members to pursue their passions and educational visions by conducting cutting-edge research to advance scientific knowledge and contribute to the global community. 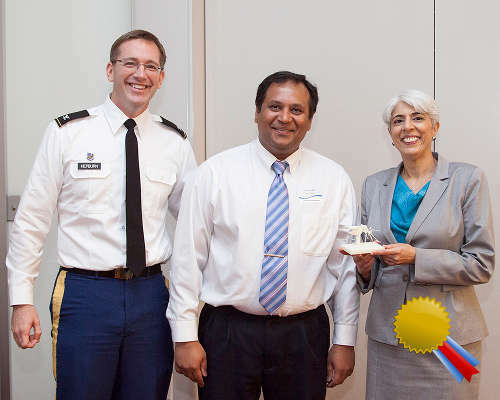 Dr. Rao (Director, PC2Lab) earns award from DARPA for the best application methodology for forecasting ongoing Chikungunya epidemic in the 52 countries in the Americas. The methodology called ForesightCHIKV, combines geospatial data on population demographics, mosquito prevalence, weather, temperature-dependent mosquito life cycles, air travel data, and socioeconomics to provide temporo-geospatial forecasts and enables comprehensive analysis of containment strategies. The details of the methodology and results from various analysis are forthcoming. Some of the initial videows illustrating the forecast of emergent epidemics is available Online via YouTube . Read more about the contest and the award in DARPA's Press Release ». MUSE is an agent-based, optimistically (Time Warp) synchronized general purpose, easy to use parallel simulation kernel optimized to run on Supercomputing platforms and Elastic Compute Clouds (EC2). Designed to handle large data sets one of the key features of of PEACE is its versatile Graphical User Interface (GUI) that streamlines clustering and assembly on desktop PCs, supercomputers, and compute clusters. SEARUMS provides a comprehensive in silico modeling, simulation, and analysis environment for large scale, temporo-geospatial epidemiological analysis using the SEIR biomathematical compartmental system. PC2 Lab actively solicits external Federal, State, and Local government agencies and organizations. It engages with K12 schools, community colleges, and other universities for collaborative endeavors and broadening dissemination. The lab culture emphasizes close interaction with industrial partners and collaborators for R&D, technology transfer, and professional experiences for PC2 Lab members and associates. The lab aims to foster research endevours with with all wings of the military and their contractors. The lab welcomes veterans and service personnel to explore and conduct research. The PC2 Lab pursues a diverse set of research investigations that primarily revolve around high performance, parallel, distributed computing. Researchers in PC2 lab have access to state-of-the-art computational platforms ranging from supercomputers, CUDA-capable compute clusters, proprietary HPCC Systems clusters, and a broad range of software. The lab employs industry standard processes and software tools for conducting research wich provides the team with professional skills that are actively sought by empolyers and prepares researchers for doctoral research. Consequently, working in the PC2 lab provides students with unparalleled education, skills, and opportunity which ensures professional and personal success for all team members. Read more about the exciting ongoing investigations and opportunities to join the lab's team of researchers. 205P Benton Hall, Oxford, OHIO 45056.